Neuroselective sensory Nerve Conduction Threshold (sNCT) studies are performed by applying a mild electrical stimulus through a pair of small disposable surface electrodes placed on the skin or mucosa. Three painless, neuro-selective electrical stimuli are applied to a peripheral/visceral nerve or dermatome innervation field in order to determine, confirm and record sensory threshold responses. Each stimulus evaluates the functioning of one of the three major subpopulations of sensory nerve fibers which together comprise more than 90% of the typical sensory nerve. sNCT studies are used to localize or map a sensory nerve dysfunction. The painless Current Perception Threshold (CPT) measures are used to detect and evaluate hyperesthetic conditions that precede progressive nerve impairment and hypoesthetic conditions that reflect a loss of functioning. 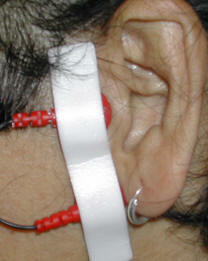 The studies are appropriate for any patient capable of indicating when they detect a change of sensation at the site being stimulated. Neurometer devices have various Modes of Operation to provide different types of measures. sNCT studies follow a standardized, automated procedure to generate objective, sensitive and reliable measures of sensory nerve function. Measures are obtained using microprocessor controlled constant alternating current (AC) sinusoid waveform stimuli presented at intensities ranging from 0.01 mAmperes to 9.99 mAmperes and at frequencies of 5 Hz, 250 Hz and 2000 Hz. The measures are in the form of Current Perception Threshold (CPT) values, each of which represents the minimum intensity of a neuroselective, transcutaneous constant electrical current required to reproducibly evoke a sensation. The electrical stimulus produced by the sNCT equipment is self-calibrating and able to maintain a constant current output regardless of normal variations in skin thickness and impedance. The system monitors the impedance at the skin electrode interface and instantly warns operators when conditions cause excessive impedance that could distort the accuracy of the measures. The system also monitors the consistency of a patient’s responses to guard against false readings due to improper procedures or non-compliance. The equipment used for sNCT studies is battery powered and portable and doesn’t require any special electrical shielding for safe and reliable operation. 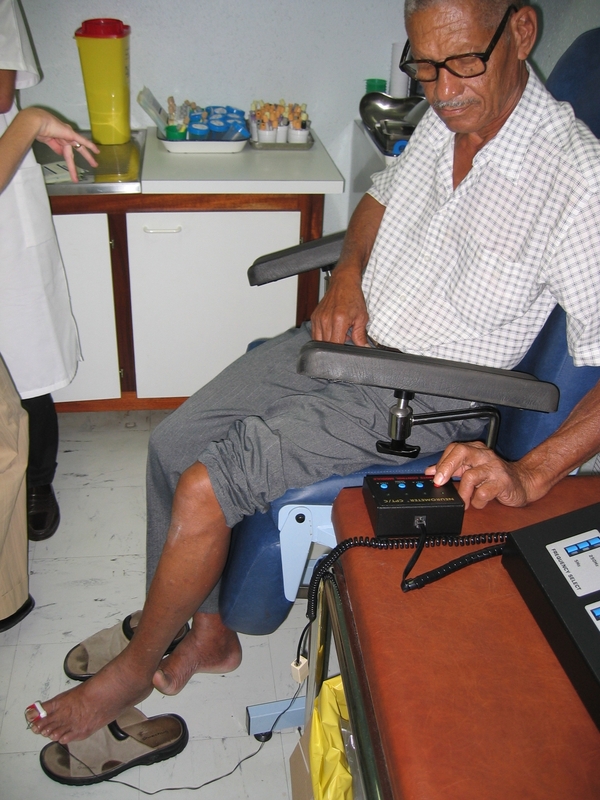 Patients can be evaluated almost anywhere they can be made comfortable and in an environment free from interruptions. Studies have demonstrated the reliability of sNCT evaluations conducted under a wide range of conditions, both in and out of clinical settings. Pre-Service Work: The examiner determines which nerves are to be studied based upon the physician’s prescription and the available clinical information. Intra-service Work: The physician or technician supervises and/or performs patient preparation including electrode placement, explains the procedure and begins the automated threshold determination study. Each nerve test site is evaluated with the three sNCT neuroselective electrical stimuli to assess both large and small fiber functioning. 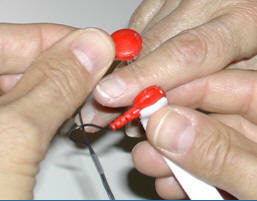 Additional testing may be prescribed during the course of the study in response to the information obtained. Post-service Work: Examination data are entered into software that evaluates and grades the sNCT measures based upon a comparison with standardized, clinically established normative values. These data are subjected to range analyses, intra-site and inter-site comparisons. The physician integrates the graded sNCT findings with clinical and other laboratory findings into a report and defines or generates the diagnosis. On occasion, suggestions for additional work-up will be included. The patient is placed in a comfortable position - typically sitting - and in a location with minimal interruptions. 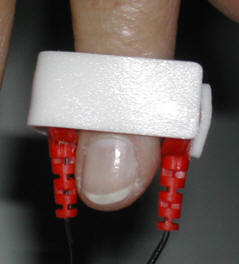 The examiner connects the electrode cable to the sNCT device, attaches a new set of 1 cm. 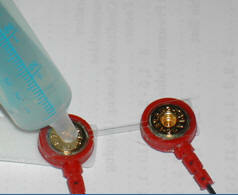 diameter, disposable gold plated electrodes to the cable, and then powers up the equipment. 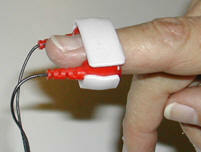 The examiner then performs a Pre-Exam Cable Test by following the directions displayed on the device's LCD screen. Successful completion of this test confirms the proper functioning of the equipment, electrodes and cables prior to each examination. The examiner explains the general nature of the test to the patient, tells them what they can expect and answers any questions they may have. The examiner then examines the prescribed skin test sites to confirm that they are free of any signs of recent trauma which could effect the sNCT measures. Finally, the examiner prepares each test site using a mildly abrasive skin prep paste that cleanses and hydrates the skin and facilitates the testing. 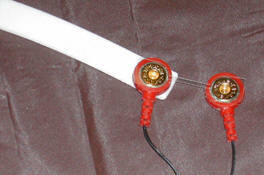 The electrodes are coated with a thin layer of electro-conductive gel and then taped to the test site on the patient. Next, the patient is presented with an automated or manual Intensity Alignment procedure that quickly narrows down the threshold level to a range of +/- 50 μAmperes out of a total range of 0 to 9.99 mAmperes. The Auto Test Mode then begins, which is a fully automatic, double-blind, forced choice procedure that determines the actual CPT measures. Patient are presented with randomly generated sets of a real and a placebo stimulus and must indicate which of the two - if either - felt stronger. Responses can be made verbally, by pushing a button or any other means through which the patient’s intent can be communicated. Depending upon the patient’s response, the sNCT device automatically re-adjusts the output intensity of the stimulus and randomly generates a new testing order for the next pair of tests in the series. Because the sNCT testing methodology is completely automated, neither the subject nor the operator can influence the testing sequence. The Auto Test Mode follows a testing methodology similar to that used in standard objective auditory tests and determines the patient’s CPT measures with a resolution of +/- 20 µAmperes to a p<0.006. When a sufficient number of correct consecutive responses have been obtained, the sNCT device calculates and displays the CPT value for the test series and optionally prints out the results. The device also monitors patient responses for consistency and accuracy, and in the event that there are inconsistent responses, the operator is alerted so that the test may be repeated or discontinued. This testing sequence is repeated for each of the three stimulus frequencies at each site being studied. The average time required to complete a three-frequency single site electrodiagnostic sNCT evaluation is approximately 10 minutes. A typical evaluation could involve testing 2, 4 or 6 sites (bilateral evaluation of 1 to 3 peripheral nerves or dermatomes) and take approximately 20-60 minutes to complete plus an additional 5-10 minutes for the initial equipment set-up and patient orientation. Electrodiagnostic testing is considered dynamic, however, in that one test may indicate that an additional test or tests are indicated or not necessary. sNCT/CPT measures are evaluated by software (link for .pdf file) that compares them to clinically determined ranges of healthy measures that have been established for dozens of different test sites. Both the CPT values and their ratios are considered when determining the degree of sensory nerve impairment and both contribute to the overall neurological diagnosis. The data analysis may include a determination of hyperesthetic and/or hypoesthetic conditions, and a detailed laboratory report and narrative are generated. As with any neurodiagnostic test, a clinician’s interpretation including a clinical correlation is essential and necessary for diagnostic purposes. A licensed physician with appropriate training interprets the results of an sNCT study by using the graded data generated by the computer analysis in conjunction with other laboratory data and clinical impressions of the patient. The location, distribution, neurospecificity and severity of the CPT abnormalities (if present) help the physician develop and confirm a diagnosis. Clinical certification courses are available for physicians which include a review of the neurophysiological basis and clinical use of the sNCT electrodiagnostic evaluation and the interpretation of the test results. Technical certification courses are also offered for technicians operating the sNCT equipment that emphasize examination techniques and use of the evaluation software.